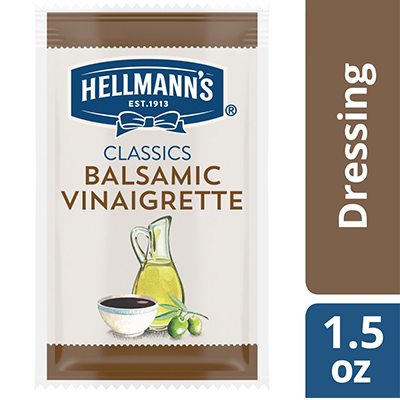 With its balanced acidity and subtle onion and herb notes, Hellmann's Classic Balsamic Vinaigrette Salad Dressing makes a versatile addition to any commercial kitchen. This gluten-free balsamic vinegar dressing is made with real, simple ingredients that your guests can trust, and it contains no high fructose corn syrup or artificial flavors. It has a subtly sweet, balanced flavor profile, making it a delicious addition to marinades, glazes, finishing sauces, and other recipes. This salad dressing has a hand-whisked vinaigrette texture and can be shaken to create a natural emulsion. It has a premium look and mouth feel that is sure to leave your guests with a positive impression.